If you have applied for your graduation check, please make sure you have paid the fee. If you haven’t paid, you are not eligible to graduate. Deadline to pay $115 Fee. The graduation ceremony for the College of Natural Sciences and Mathematics will take place on Saturday, May 18th at the Titan Stadium. We estimate that the college graduation will last two hours. All Commencement Ceremonies will be over by 11 a.m.
After April 22, tickets will no longer be available, except for an “extra ticket” distribution on April 26 for venues that have not completely filled and can accommodate more guests. The extra tickets will also be electronic and can be printed out at the following link (see link above). Tickets will be given out in pre-determined numbers to graduates on a first-come/first-served basis. Warning: Each ticket will have its own unique scanning pattern. Once a ticket has been scanned, it is no longer usable. Duplicating tickets are not valid. Hard copy of the printed tickets must be presented for entrance into the college graduation ceremony. Ticket images presented on electronic devices will not be accepted. 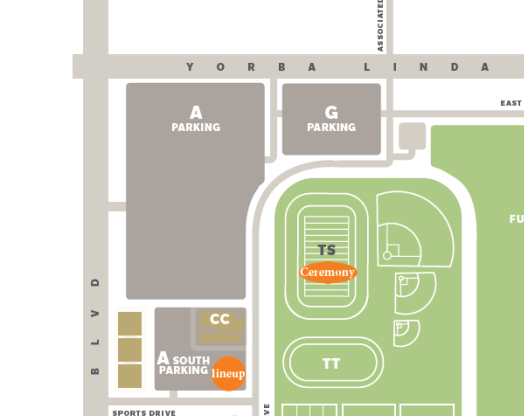 Parking Permits: Graduates can pick up two commencement parking permits at GradFest (March 26-28 at Titan Shops and April 11 at Irvine Campus). Name Cards : will be given out at line-up the day of graduation. Money-saving graduation packages and one-stop graduation shopping will be available at Grad Fest. This is the ideal opportunity to purchase a cap and gown, pick up your free commencement 2019 parking permits, arrange photography appointments, order announcements, purchase a class ring, and pick up additional information on commencement, the CSUF Alumni Association and more.